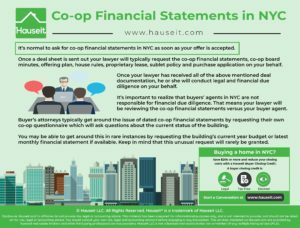 What do sample co-op financial statements in NYC look like? Who’s responsible for analyzing and doing financial due diligence on your behalf? What can you learn about a building from just its financial statements? 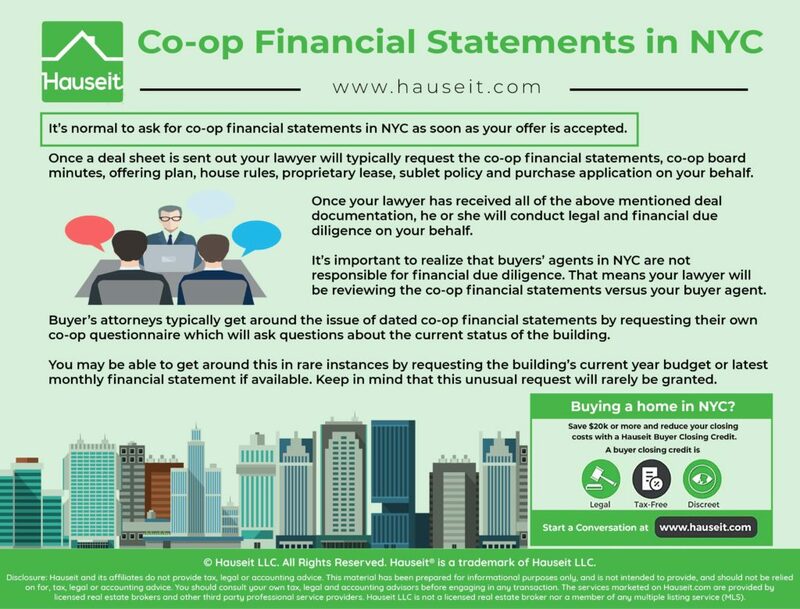 It’s normal to ask for co-op financial statements in NYC as soon as your offer is accepted. 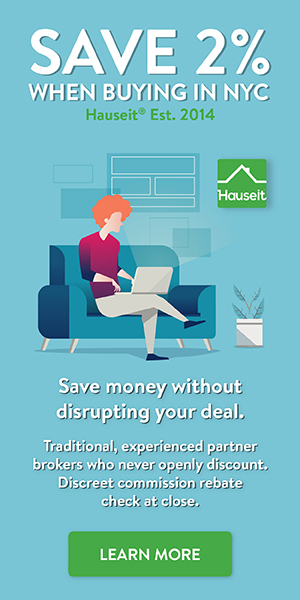 Once a deal sheet is sent out your lawyer will typically request the co-op financial statements, co-op board minutes, offering plan, house rules, proprietary lease, sublet policy and purchase application on your behalf. It may be possible to get a copy of the co-op financial statements before submitting an offer if your buyer agent makes the listing agent understand that you are a serious, pre-approved or all cash buyer who has been looking for quite some time. Once your lawyer has received all of the above mentioned deal documentation, he or she will conduct legal and financial due diligence on your behalf. It’s important to realize that buyers’ agents in NYC are not responsible for financial due diligence. That means your lawyer will be reviewing the co-op financial statements versus your buyer agent. You are free to peruse them yourself, but just know that if you have a good attorney, he or she will already be thoroughly combing through them! We’ve included a set of shorter than normal sample co-op financial statements below. Please note that these statements can often be much longer in length and substance. Not all co-op financial statements will be audited like this one has been. Please note that you will normally only be provided annual financial statements, meaning that there will always be a lag and you will never be able to see the current financial status of the building as of today. Buyer’s attorneys typically get around the issue of dated co-op financial statements by requesting their own co-op questionnaire which will ask questions about the current status of the building. You may be able to get around this in rare instances by requesting the building’s current year budget or latest monthly financial statement if available. Keep in mind that this unusual request will rarely be granted. You may not even want to ask for this information as you may risk board rejection by appearing to be difficult. We have audited the accompanying financial statements of [ADDRESS] OWNERS CORPORATION which comprise the statements of Assets, Liabilities and Stockholders’ Equity – Income Tax Basis as of December 31, 2016, and the related statements of Revenues and Expenses – Income Tax Basis for the years then ended, and the related notes to the financial statements. Management is responsible for the preparation and fair presentation of these financial statements in accordance with the basis of accounting the Company uses for income tax basis purposes. This includes determining that the income tax basis of accounting is an acceptable basis for the preparation of the financial statements in the circumstances. Management is also responsible for the design, implementation, and maintenance of internal control relevant to the preparation and fair presentation of financial statements that are free from material misstatement, whether due to fraud or error. In our opinion, the financial statements referred to above present fairly, in all material respects, the financial position of [ADDRESS] CORPORATION as of December 31, 2016, and the results of its operations for the year then ended, in accordance with the basis of accounting the Company uses for income tax purposes described in Note 2. The Company has not presented the supplementary information about the estimates of future costs of major repairs and replacements that accounting principles generally accepted in the United States of America require to be presented to supplement the basic financial statements. Such information, although not a part of the basic financial statements, is required by the Financial Accounting Standards Board, who considers it to be an essential part of financial reporting for placing the basic financial statements in an appropriate operational, economic, or historical context. Our opinion on the basic financial statements is not affected by the missing information. Even though these financials are only current as of the end of the last fiscal year, you can still learn quite a bit about how the building is run. From these sample co-op financial statements you can tell that the building is quite frugally run, has more revenue than expenses and has kept costs for services relatively low. This is a great building to be in! [ADDRESS] CORPORATION (“The Corporation”) was incorporated in New York in May, 1984. Operations commenced in July, 1985, when the property was converted to cooperative ownership. The Corporation qualifies as a cooperative housing corporation under Section 216 of the Internal Revenue Code. The Corporation’s shares have been issued representing 8 tenant shareholders’ units represented by 624 shares. The accompanying financial statements have been prepared on the cash method of accounting used for federal income tax purposes. Consequently, certain revenues and expenses are recognized in the determination of income in different reporting periods than they would be if the financial statements were prepared in conformity with generally accepted accounting principles. The building is being depreciated on the straight-line method over 27.5 years. Expenditures for major improvements and betterments to fixed assets are capitalized, and expenditures for repairs and maintenance are expensed as incurred. The property was acquired in a tax free exchange in accordance with Section 351 of the Internal Revenue Code. Consequently, the Corporation’s tax basis in the property for income tax depreciation purposes is the sponsor’s basis, increased by the amount of gain recognized by the sponsor in the exchange. The mortgage was refinanced in 2003. The prior mortgage with the New York Community Bank ($68,785 principal balance) was replaced by a new mortgage with the same bank in the amount of $80,000 on April 31, 2003. The new mortgage payable, secured by the land, buildings and improvements, is payable in equal monthly installments of $836.42, consisting of interest at the rate of 5.75 percent per annum, with the balance of the payment applied to the unpaid principal balance. This amount does not include any monthly escrow due. The mortgage is for a term of fifteen years. Assuming that the Corporation has made all of the payments, the mortgage will be fully paid off on April 4, 2019. Maintenance charges assessed to the tenant-shareholders are intended to cover operating expenses of the building, as well as amortization of the mortgage debt. Accordingly, the portion of maintenance used for amortization of the mortgage is added to the stockholders’ equity as additional paid-in-capital. The Corporation has not conducted a study to determine the remaining useful lives of the components of the common property and current estimates of the costs of major repairs and replacements that may be required in the future. When replacement funds are needed to meet future needs for major repairs and replacements, the Corporation may have the right to borrow, utilize available cash, increase maintenance charges, pass special assessments, or delay repairs and replacements until funds are available. The effect on future assessments has not been determined at this time.